The Ute market is very buoyant at the moment. New releases, special editions all add to the plethora of choices. In a crowded market Toyota’s HiLux is the bestselling Ute on the market and has a long and enviable reputation. To further create anxiety over choosing a Ute, Toyota has created the boldest, most aggressive-looking production HiLux yet by teaming Australia’s “unbreakable” best-selling car with the company’s TRD parts division. The special edition comprises fifteen new components, seven of which come from the TRD (Toyota Racing Development) stable, that transform the tough 4×4 turbo-diesel HiLux into an even more rugged workhorse. Potential buyers should note that the TRD package is exclusively available for buyers of the top-of-the-range HiLux SR5 double cab with leather-accented interior trim and either black or white exterior paint. Toyota has further sweetened the deal with drive-away pricing that starts at just $58,990* – potentially saving buyers thousands of dollars. The transformation starts at the front with a dramatic red TRD-branded skid plate, which provides a stark contrast to the powerful new black TRD grille, TRD lower bumper cover and TRD fender flares. Edgy black 18-inch six-spoke alloy wheels and a robust black sports bar enhance the unabashed macho look of this special HiLux, which also features black mouldings along the body side and the leading edge of the bonnet. The striking exterior makeover is completed at the rear through the addition of a towing kit (tongue, ball and wiring harness), Ute liner, soft tonneau cover, taillight covers and TRD mudflaps. Inside, the tough, functional and comfortable HiLux adds to its refinement with TRD carpet floor mats and, for automatic variants, a TRD gear knob. Toyota Australia’s executive director sales and marketing Tony Cramb said the SR5 grade was chosen for the TRD special treatment because it accounted for more than half of all 4×4 HiLux sales in 2016. 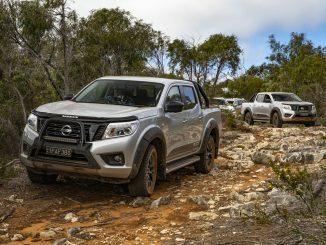 “Local buyers voted with their wallets to make HiLux the best-selling vehicle in Australia last year – and the majority clearly indicated their preference for upmarket features combined with HiLux’s renowned go-anywhere capability,” Mr Cramb said. “We have responded to that demand by compiling premium components, including the respected TRD brand, that will further distinguish HiLux from the competitors and from every other HiLux in our range,” he said. The TRD-enhanced HiLux is powered by Toyota’s 2.8-litre turbo-diesel engine that delivers 130kW of power with peak torque of 450Nm (six-speed electronic automatic) and 420Nm (six-speed intelligent manual). Other standard features include climate-control air-conditioning, cruise control, satellite navigation, Toyota Link connected mobility#, power-operated driver’s seat and a display audio system with DAB digital radio, Bluetooth®^, voice recognition and steering-wheel controls. Comprehensive off-road and safety technology includes a rear differential lock, electronic transfer case, vehicle stability and traction control, trailer sway control, seven airbags, reversing camera, anti-skid brakes and auto-levelling LED headlamps. The TRD-enhanced HiLux is also equipped with black side steps, keyless smart entry and start, hill-start assist control and, for automatic models, downhill assist control.